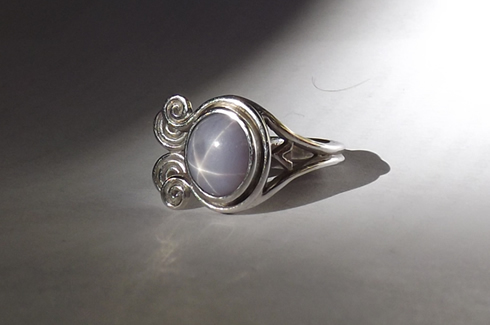 To give Amy a ring as unique as her, I knew I had to design it myself. With fabrication help from Aubrey, I created a design with lots of personal touches and elements from our history. However, the result, made from wound silver wire, was definitely not super professional, nor was it going to last a lifetime. When we got back to the US, I decided to port the design to a more durable form: a solid gold band. We connected with Beeghly and Keim, a local jewelry store that had a fabrication studio in their basement. Working in CAD and communicating primarily by email, we hammered out a final design, which was ultimately CNC milled out of a block of wax and cast using a lost-wax method. 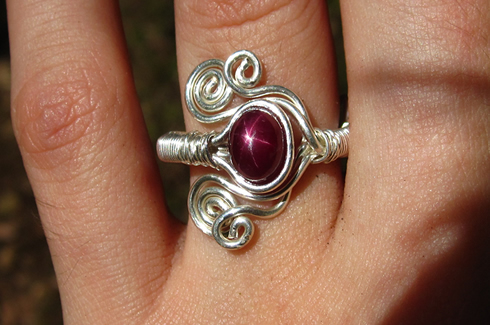 It’s one of kind, largely mirroring the wire original, with a little tent nestled into one side, Aztec-inspired spiral motifs, and Amy’s touch: our engagement date in Mayan numerals (we traveled a lot to central America while we were dating). While working with Beeghly and Keim, it occurred to Amy and I that we should make my wedding band as well – something that I wanted to wear for a lifetime. I also wanted to create something unique, and hit up friends and family for ideas. Coincidently, I was working on a research project at the time that used static projectors. 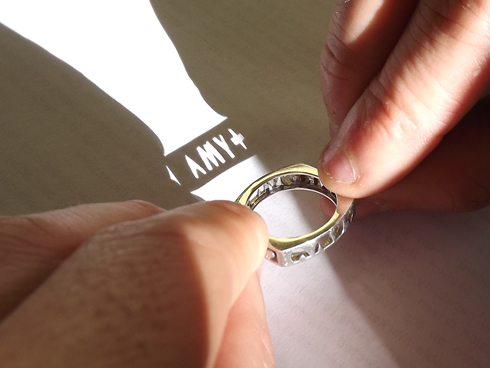 I realized I could create a ring design with two layers, that when AND-ed together, yielded a special message. Because there are no optics, this only works for point light sources, such as the sun. 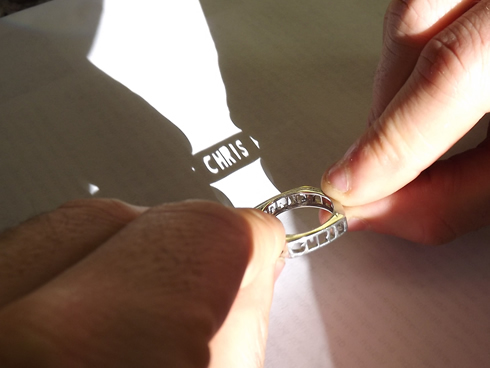 I created the four masks (pairs on opposite sides of the ring) that produced the text “Amy+Chris”. Beeghly and Keim, initially skeptical it would work, enjoyed the challenge and figured out the ring geometry.